Now is the time when current seventh grade students select their elective choices for their eighth grade year. 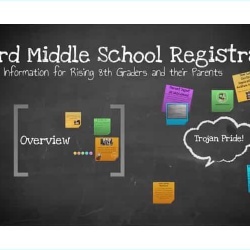 All seventh graders should complete the course request survey by January 30. Eighth grade students have an option to take up to three periods of electives, depending on the other courses they take. Please select from the list of elective options for 2019-20 (see below). For additional information and scheduling help specific to Buford, watch these helpful videos produced by our school counselors. Garden Aid (Full Year): In the garden aid class, students take leadership roles in maintaining the garden throughout the school year. Their class time includes planting, harvesting, and watering, along with planning for the next growing season and learning hands-on about the science and history of growing food. Early Morning PE (Full Year)^: Students who want to take an additional elective can sign up for early morning PE. The days this course meets is TBD but it will meet from 7:30-8:15 am. Students mustprovide their own transportation.